We are homeowners no more. Our house in Portland closed today, I will always love that old house but I’m glad the selling process is over. Here’s hoping its new family will love it as we did, and that when we are ready to buy a house here in Arizona we will be as happy. I took this picture of Ellie in the hallway outside my office back in February as I walked the path that would lead us from Oregon, with one job offer in hand and less than two days away from flying to interview in Arizona and getting the offer that brought us here. One downside to the old house for our old pup was that to the right of her are stairs leading up to our bedroom. 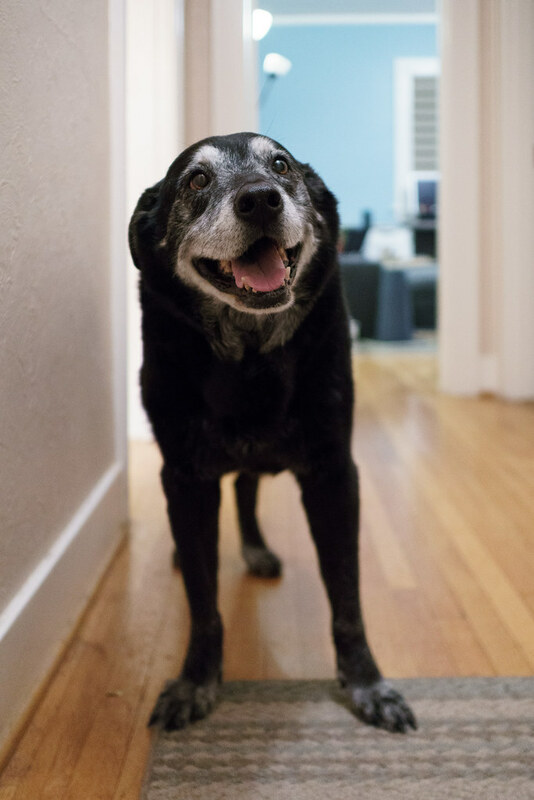 She couldn’t navigate the stairs very well in her elderly years (she could go up just fine but coming down could be a challenge), so we had to block off the stairs to keep her from following us upstairs to bed. She couldn’t go downstairs to the basement where my wife’s office was, so she spent her days with me on the main floor and her nights asleep in one of her beds, waiting for us to be reunited. We have a lovely rental home here and Ellie is delighted that it is only one story. She can follow us to bed and follow us to our offices. And follow she does, follow, follow, follow, a black shadow follows you everywhere you go. She’s laying beside my couch now, she’ll follow me to bed when it’s time. I wish everyone could know the love of such a sweet dog, to be looked at as lovingly every day when they get up in the morning and when they come home at night. Thankfully she is still doing well for her age, I pray it continues as every day with our dear Ellie is a blessing, no matter the location. This entry was posted in General, Pets and tagged black lab, dog, Ellie, hardwood. Bookmark the permalink.